This is certainly a different type of island destination than you may expect for a destination wedding or honeymoon. It’s the land of insanely friendly locals, lush green hills, and the Wild Atlantic Way where the ocean rolls along the rough edges of the earth. If you lean more on the adventurous side and want to spend this special time winding your way through the teeny-tiny Irish towns, hiking through National Parks which look more like movie sets, and cozying up to some hearty Irish food while taking in foot-tapping live music every night, Ireland is right up your alley. Plus, you can truly get married IN a castle, if you want! This devilishly handsome country has been the host to plenty of weddings and honeymoons of foreigners for quite literally hundreds of years. Why? Well, how does getting married in front a 13th Century Castle like the Eilean Donan Castle sound? It’s one of the most photographed castles in the world and set on the edge of three of Scotland’s most picturesque lochs. If you’re into mountains, pristine water, beautifully aged Scotch Whisky, and abounding adventures, Scotland is chock-full of all these things and plenty more. You can spend your days trekking through the Highland region of towering mountains and move onto some of the cities like Edinburgh and Glasgow, which are equally as picturesque. If you’re into somewhere a little less conventional, Slovenia is actually a postcard. The capital city of Ljubljana is just about as perfect as any European city; full of canals, bridges, and cobblestone streets. There are plenty of adventures to be had in Slovenia -- think day trips to the unbelievably beautiful Lake Bled, where the lake and the surrounding countryside may just make you want to stay on a forever honeymoon. And if it’s a relaxing beach you’re after, you’ll be pleased to know Slovenia has a little slice of that type of paradise as well. With a teeny tiny 29 miles of coastline along the Adriatic Sea, there are some pretty freakin’ epic beach towns like Izola and Piran. Here you can jump back in time to old fishing villages, and have a dip on some less-populated beaches and you’ll feel like you’re in the Italian Riviera. This list would be absolutely remiss without including Paris. Yeah, yeah, yeah...it is the City of Love and terribly romantic and all that, but it’s a classic wedding and honeymoon destination for a reason. 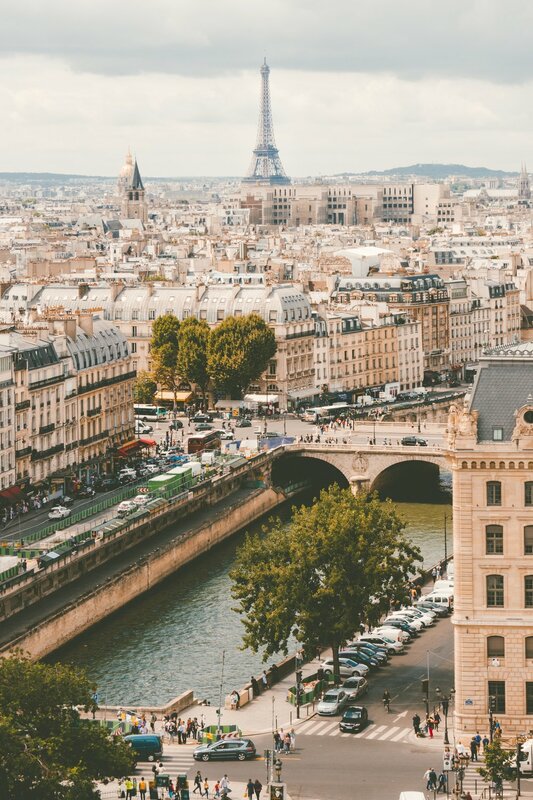 Walks along the Seine River, picnics in the park with the Eiffel Tower as a backdrop, spending hours in painfully beautiful cafes with not a darn thing to do but enjoy wine, cheese, espresso, and the best meals of your life. If that’s your idea of a good time, that’s why Paris is such a classic choice. And beyond all that good stuff, the city is over 2,000 years old and chock-full of museums to occupy if you can pry yourself away from the bakeries and jazz clubs. I promise you, I’m not even over-selling it. It’s just that good. Of course, if you are on a luxury budget, the George V is the way to go. When in Paris...right? And for a honeymoon or destination wedding, it’s kinda perfection. Whether you want to retreat to the Tuscan countryside and sip wine, or putt your way along the southern coast in the Puglia region and dip in that quintessential turquoise water of the Italian Riviera while sippin’ on Bellinis, it’s a guaranteed good time for everyone. If you want a far-flung destination, but don’t want to completely blow out your budget, head to Thailand. With the low cost of living and great exchange rate for the US Dollar, you can stay in 5 star accommodations for a fraction of the price you would pay in any European city. It’s an opportunity to have a luxurious vacation when you otherwise may not be able to swing that type of vacation on your budget. Thailand has inviting, turquoise water and pristine beaches to relax on. It’s a wonderful blend of the big city of Bangkok, and the option to island-hop on some of the best beaches in the world. Heading to the north of the country will bring you to the jungle, where you can visit Elephant sanctuaries and spend some time exploring more of nature. And let’s not forget the Thai food….all the Thai food. **keep in mind, depending on where in Thailand you go, the weather can vary dramatically. For example, on the East islands November is their rainy season, while on the West islands, it’s their peak tourist season and fairly dry. If you’re looking for a winter wonderland to spend your honeymoon, or have as the backdrop for your destination wedding, Canada has all the things -- the towering Canadian Rockies, perfectly clear alpine lakes and some of the most outstanding nature in the world. Obviously the country of Canada is massive, and you can find virtually any kind of winter experience you want there. Spend this time inside some of the National Parks, where those massive, alpine lakes freeze over. If you are into winter activities and sports, head to Whistler where you can ski some of the best slopes and snow in the world. Or, go for a more romantic, European feel in either Montreal or Quebec. Here you’ll find narrow cobblestone streets, locals speaking French Canadian and all the charm of any European city, complete with holiday lights. Ahhh, Portugal. The sunny country absolutely packed with incredible beaches. With plenty of really cool, colorful Gothic architecture set in stunning landscapes, it’s a pretty amazing place to host your family and friends for a wedding, or simply relax and explore as honeymooners. The capital city of Lisbon is set on the hills overlooking the Atlantic Ocean, and the Northern city of Porto, the origin of Port wine, is equally worthy of a visit. Head to the south of Portugal, to the Algarve region for some picture perfect beaches and white-washed fishing villages. It has a bit of everything, and enough exploring to keep you busy, and a plethora of lovely spots sip a nice cold Portuguese beer at the beach. This is a wild card for a few reasons; mainly because it’s not really on the tourist track (just yet!) and also because your average person probably doesn’t know much about it, or for that matter, can even point to it on a map. So, I give you Romania. And she will absolutely dazzle you. The capital of Bucharest and the surrounding smaller cities of Sibiu and Brasov, are right up there with the most beautiful cities in Europe. If you know something about Romania, it’s probably the fact that this is where Transylvania is -- a region in central Romania full of castles set deep into mountains. In fact, you can make a trip to the Transylvanian Alps that have sweeping views of beautiful countryside dotted with farms, cows, and colorful villages. Other bonuses are: it’s inexpensive, there’s beautiful architecture, and lush mountains and forests. And if you’re looking for a little bit of a beach vacation, the Eastern border of Romania sits on the Black Sea, and has some wonderful sandy beaches. If you’re a outdoors-lover and want to spend this time in nature, Jackson Hole might be just what you’re looking for. Located just outside of Grand Teton National Park, it has small-town charm and so, so many activities to keep your days as busy as you want to be. Grand Tetons National Park is, of course, filled with hiking trails which wind through this towering mountain range, wild buffalo roaming through the fields and plenty of pristine lakes to cool off in. If you’re looking for a dramatic backdrop for your wedding, or an adventurous destination to spend your honeymoon, Jackson Hole is up there in the running for most beautiful places in the world.